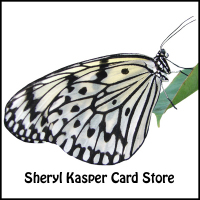 About Me: Sheryl Kasper Card Store offers unique illustrations & photographic paper greeting cards. Caring Cancer Cards, Holiday, Birthday, Anniversary, Invitations & Religious Ordination Cards are just some of the unique cards that I offer. It is my hope that my cards will encourage, inspire, or touch your lives and make you smile. Thank you for your interest in my cards. I truly appreciate and want to thank all my customers for their support. Welcome to Sheryl Kasper Greeting Card Store where you can find cards for many different occasions with images of photography and illustrations. You can choose the option to have your card order sent to yourself, or to your recipient directly from Greeting Card Universe. You can "CUSTOMIZE THE INNER VERSE" on all cards ... and you can "CUSTOMIZE THE FRONT TEXT" on a select number of Cards. Great selection of cards Sheryl. Sheryl, Congratulations on getting "The Design Of The Day"! I love your selection of cards - very beautiful! Your thanksgiving turkey is adorable! Nice Job!! Great designs...very unique! Your artwork as well as your photography is just wonderful! love your cards - you and i have a common theme - flowers! Wonderful store, you have a great collection of cards! Excellent work. Thanks for your kind welcome! Sher - wonderful collection! Absolute favorite is the poinsetta, it's beautiful! Awesome store you have here. I had alot of fun browsing your shop. you have some awesome cards! Very nice shop and variety of cards. I especially love your flower cards with the black backgrounds... absolutely beautiful! I would like to thank you for your visit to my card shop! Thank you for your wonderful comment! I would like to say that your gallery and cards are beautiful! Lovely work you have here! Amazing! Have a wonderful and lovely New Year!!! I still love the script type style on your header. Wonderful store - You have a great design eye ! Awesome work Sheryl! Your still lifes bring these inanimate objects to life. Composition extremely well done. I look forward to each addition to your gallery! Your cards are beautiful and very creative Sher !! Congrats on your lovely shop. I Know you will sell tons !!! Keep up the fantastic work.